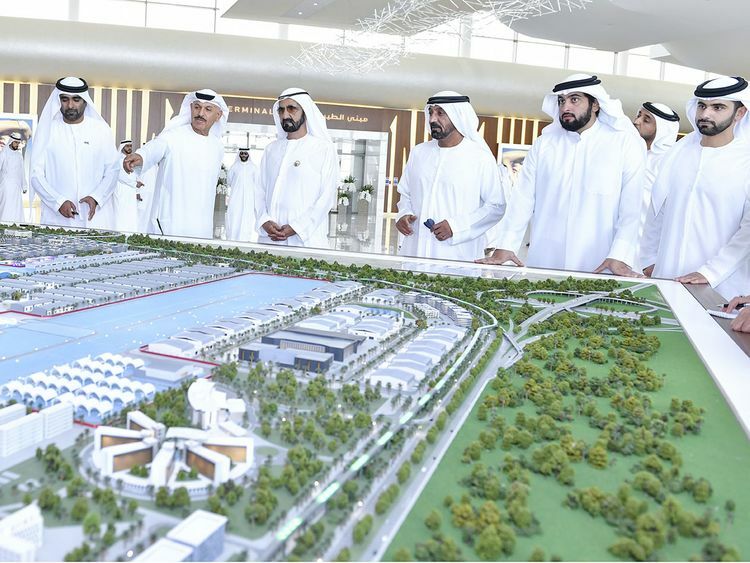 Dubai: His Highness Shaikh Mohammad Bin Rashid Al Maktoum, Vice President and Prime Minister of the UAE and Ruler of Dubai, has commended the progress of the Dubai Aviation City’s project in Dubai South, which is near the Expo 2020 site and set to cover 145 square kilometers once completed. While touring the project, Shaikh Mohammad lauded the efforts of teams from Dubai Airports Corporation and Dubai World Central, who are overseeing and implementing the landmark project, which will lay the foundation for the civil aviation industry regionally and internationally and place the UAE among top nations famous for high-tech and vital industries. Shaikh Mohammad stressed the importance of the aviation industry in supporting the national economy and said that it is a key engine for the development and economic prosperity in the country. As part of his visit, the Vice President toured reception halls for private jet users travelling through Al Maktoum International Airport. He stopped at the Duty Free, which showcases a wide range of global brands, and was briefed on the interior design of the Falcon company’s hall, one of the three companies operating in this terminal besides Jetex and Jet Aviation. The Dubai ruler was accompanied by Shaikh Ahmad Bin Saeed Al Maktoum, Chairman of Dubai Civil Aviation Authority and Chairman and Chief Executive of Emirates Airline and Group, Shaikh Ahmad Bin Mohammad Bin Rashid Al Maktoum, Chairman of the Mohammad Bin Rashid Al Maktoum Knowledge Foundation, and Shaikh Mansour Bin Mohammad Bin Rashid Al Maktoum, as well as other Shaikhs and senior officials.